Clinical Neuroanatomy and Neuroscience by Drs. M. J. T. FitzGerald, Gregory Gruener, and Estomih Mtui, already known as the most richly illustrated book available to help you through the complexity of neuroscience, brings you improved online resources with this updated edition. You’ll find the additional content on Student Consult includes one detailed tutorial for each chapter, 200 USMLE Step I questions, and MRI 3-plane sequences. 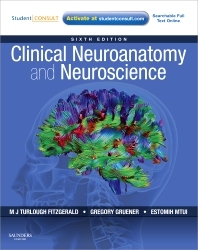 With clear visual images and concise discussions accompanying the text’s 30 case studies, this reference does an impressive job of integrating clinical neuroanatomy with the clinical application of neuroscience. Aid your comprehension of this challenging subject by viewing more than 400 explanatory illustrations drawn by the same meticulous artists who illustrated Gray’s Anatomy for Students. Get a complete picture of different disorders such as Alzheimer’s disease and brain tumors by reading about the structure, function, and malfunction of each component of the nervous system. Grasp new concepts effortlessly with this book’s superb organization that arranges chapters by anatomical area and uses Opening Summaries, Study Guidelines, Core Information Boxes, Clinical Panels, and 23 "flow diagrams," to simplify the integration of information. Use this unique learning tool to help you through your classes and prep for your exams, and know that these kind of encompassing tutorials are not usually available for self-study.